Deskun is a multichannel help desk system that integrates wholly into Gmail. Installed via a Google Chrome plug-in extension that also boasts compatibility with Yandex Browser, the solution is freely available with limited features while affordable monthly business pricing offers complete access for multiple agents and variuos channels. Major features then span customer support across different channels such as live chat, email, Facebook, WhatsApp, Twitter, Skype, Viber and Telegram, where customer requests can be handled and responded to effectively, and assigned to invited support agents within a broader team. 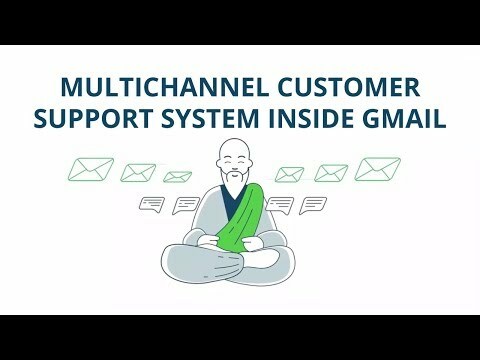 Users can then add new channel for e-mail or live chat support, raise tasks and actions with specific set deadlines before monitoring help desk employee performance. Deskun's specific features go on to add message templates and the ability to create faster, reusable responses when composing new correspondences. These messages can then be flagged for sending only at a specific date and time or be queued as "snooze" follow-up reminders that will reappear unread in an inbox later. Notes can be shared privately to exchange internal information within teams, while Deskun also makes it possible to connect other email accounts for processing client requests externally. I’m a freelance designer, for me the major benefit is the price, it’s really cheap. It’s great that I can manage my projects and communicate with my clients in one place, Deskun removes some unwanted actions and makes the process much easier. It helps me organize my projects and tasks by priority. There were several issues with Deskun work on my machine, but they were fixed quickly. Also I lack the ability to set custom statuses for tickets, sometimes I need more than preset statuses, e.g. there’s no status “In progress”. Great G Suite integration, works quite stable after setting up even with a big amount of tickets. Very low price for such product. I enjoy checklists when setting tasks to employees. Also Deskun support team answers quickly. There's no mobile version, and it only goes as a Chome plugin. Some people in our team use Safari for example. It was quite tricky to set up, as for me. We're using Deskun in small team of 5 people to organize customer support for our webstore. Overall the system works good, we haven't noticed any inconveniences yet. One minor flaw - Deskun doesn't work in Safari browser.Mailtracking, message templates, snooze, simple interface. Mailtracking, message templates, snooze, simple interface. Deskun is an integrated solution that combines different communication channels: live chat, email, Facebook, WhatsApp, Twitter, Skype, Viber and Telegram for Gmail-based customer support for an affordable monthly business rate. Quick installation is ensured via the free Google Chrome browser extension, also supported by Yandex Browser, allowing users to create personal accounts and invite subsequent agents. Promising a lightweight and compact design, Deskun boasts a clear and convenient interface with an emphasis on enabling help desk users to respond to tickets or handle chat conversations in a minimal amount of clicks. Message templates save time when composing email responses and answering common requests, while correspondences can be scheduled and tracked to see when they were read. Below are some frequently asked questions for Deskun. Q. What type of pricing plans does Deskun offer? Q. Who are the typical users of Deskun? Q. What languages does Deskun support? Q. Does Deskun support mobile devices? Q. Does Deskun offer an API? No, Deskun does not have an API available. Q. What other apps does Deskun integrate with? Q. What level of support does Deskun offer?